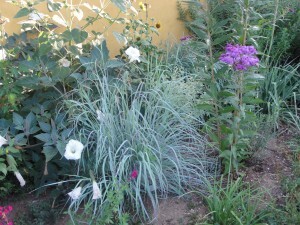 More and more savvy gardeners have come to realize that grasses possess sterling merits in our landscapes. The right grass in the right spot can provide a fine textured fountain of beauty much of the year, often with the bonus of subtle, but often evocatively beautiful sprays of bloom. Most grasses are adaptable, very long lived and easy to maintain in the landscape. Almost all possess something special: a sinuous capacity of shivering motion that gives the pulse of life to your garden, and gently sways in even the quietest breeze. Grasses can truly be said to give a breath of life to the landscape—and WINDWALKER® big bluestem especially so. Big bluestem occurs natively across much of America, particularly in the tall-grass prairie where this is a dominant element. It is wild here and there on Colorado’s great-plains, usually in slight swales with a tad more moisture. It nevertheless constitutes an ironclad xeriscape plant that thrives with little or no supplemental irrigation in most landscapes, although it will grow a bit more lushly and tall with a bit of water. The foliage makes a perfect narrow fountain of shimmering blue in this cultivar that morphs into a dark, maroon lavender in fall, persisting thus through the winter. The flower stems reach up in late summer to four or five feet, with tasseled flowers shaped fancifully like turkey feet (its other common name). We’ve grown this many places at Denver Botanic Gardens, and it shines wherever it grows—and has never produced too many seedlings or caused any issues. This is a glorious native plant I would not want to be without, nor should you! View the plant profile here. I’ve found this beautiful blue big bluestem to need a bit more water than my xeric grasses, but with occasional deep waterings during the season it grows beautifully in my garden at 5500′ in northern Colorado. Where might I find big blue stem plants to purchase? Is it possible to start it from seed? 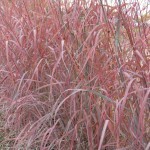 The WINDWALKER Big Blue Stem plants are hard to find right now, but they should become available at garden centers when the season gets hot and they look really good. They are not true to seed, so no seed is sold. If you don’t see this plant in July at stores ask for them by name where you shop and I’m sure they can bring them in. Where can I get “Windwalker” tall grass? I am in Lexington, KY.
Not sure that far east yet. They should be rolling out of North Carolina next year though. You may have to back order these from High Country Gardens online for now.